Commodawg sent me a quick email containing only a url link and a note: “I’m guessing this is in your wheelhouse.” The link led to an ESPN/Outside the Lines feature, “The Long, Strange Trip of Dock Ellis.” Commodawg was right: I am never not on drugs when working on this website, an admission that likely comes as no surprise to ALDLAND’s reader(s), so this piece is pretty squarely in my wheelhouse. I’ve read all the stories about Ellis. I’ve seen all the videos, including the one everybody considers high art (no pun intended, seriously; it’s way overrated, its only redeeming aspect being the employment of actual audio of Ellis) and the one of former Deadspin editor A.J. Daulerio’s less entertaining stunts, in which he attempts to pitch a no-hitter in a video game while under the influence of LSD. Save yourself some time and watch neither. 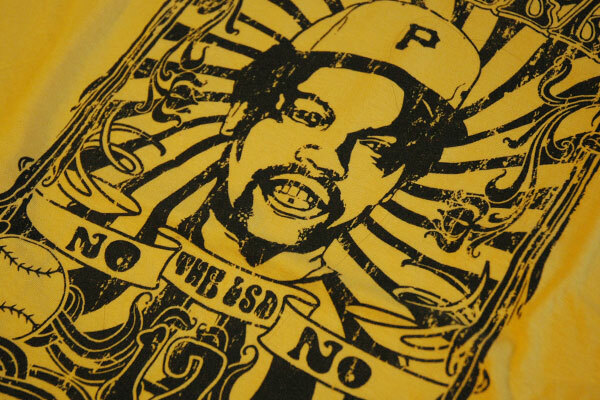 The only real rub in the Ellis story at this point is whether Ellis really was on acid when he pitched that no hitter. Some recent writers (again, I’m sparing you the links) have advanced a view of Dock that suggests he was good at making up and perpetuating stories to fuel a love of the spotlight, implying that the most famous story about him was such a fabrication. Obviously that’s a boring road to go down. This ESPN/OTL piece by Patrick Hruby and Joe Ciardiello blows right by all of that, though. It’s transcendent not because it’s about drugs, but because it transcends the debates and localized tropes that bring people to Ellis and tells a real story that answers all of these lightweight questions without even asking them because it starts with little baggage. It just tells the story of the man. Don’t feel bad if you found your way to Ellis, even to this post, because you kinda want to find out what it’s like to take LSD– that’s the reason anybody who didn’t know him or isn’t a weirdo fan of the Pirates finds their way to him– but know that your preconceived inquiries will be both resolved and shown to be irrelevant. The digital design features of the piece play no small part in contributing to this article and deserve separate comment from someone authorized to make such comments, but they extremely appropriately add to the experience, both visually and substantively. Rereading what I just sputtered, maybe this one does convey what it’s like to be on acid after all. This entry was posted in ALDLAND and tagged dock ellis, drugs, espn, mlb, pirates by AD. Bookmark the permalink.